The VinniBag stores easily and keeps your bottles safe while you travel. On a trip to Spain last year, a friend gifted me with a fantastic bottle of locally grown olive oil. I would’ve loved to bring it home, but I refused as I still had fresh memories of a bottle of contraband Czech absinthe that burst and ruined my bag several years earlier. If only I’d had the Vinnibag with me. The Vinnibag is the perfect tool for transporting that rare bottle of wine, olive oil or exotic perfume home with you from your trip. Empty, it takes up virtually no room in your suitcase, but once inflated it suspends items in an air cushion, providing protection against impact and leakage. 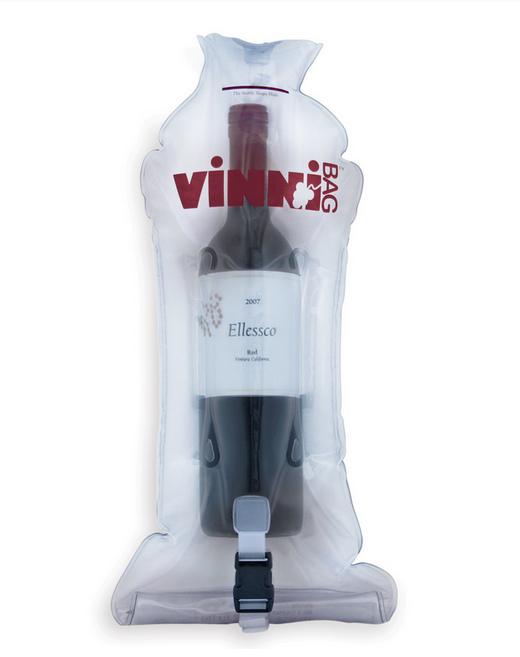 The Vinnibag features a reusable liquid dry-seal to keep leaky items away from your clothes, in the unlikely event that the worst happens. Even better, it’s reusable, recyclable and made right here at home.